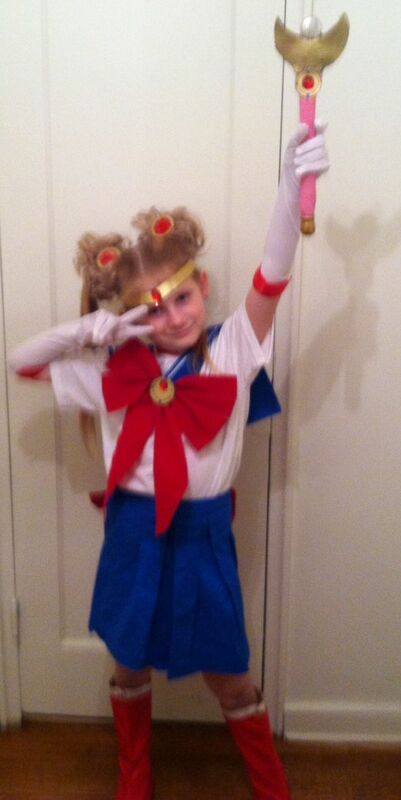 So you have all seen her dress as Sailor Moon….twice(here and here). And you have seen her sing ‘Let It Go’…..twice(here and here). The next step seems pretty obvious. Skyler wanted to sing a ‘Let It Go’ song all about Sailor Moon in honor of the Sailor Moon goodness that is happening. So I sat down and wrote the lyrics for her and she practiced. I made any repairs to the costume that needed doing since being worn for NY ComicCon, a Girl Scout Halloween Party, the school Halloween party and Trick-or-Treating. We used a black plastic tablecloth for the backdrop with a moon taped to it. We found the kitchen had good enough acoustics to record the song and then we were set. Well, after 10 takes due to wardrobe issues (accidentally ripped off her bow), lyric oops (started singing ‘Let It Go’ at parts), and prop distractions (almost took the camera out with the wand). This song is dedicated to a wonderful nurse that moved away. Nurse Kate, you were amazing and I don’t think that any nurse will ever live up to the bar you set in the kids’ eyes. Where else are we going to find someone who loves the same things as all 3 of us? From Doctor Who to Firefly, Meowchis to Sailor Moon, and, most importantly, Cosplay Tips, you made every visit with you memorable. We miss you terribly and hope you are having a wonderful time in your new state and job.